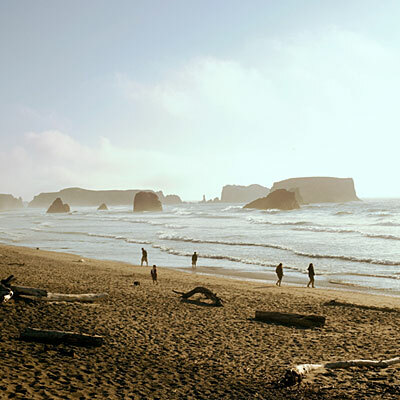 Sunset Magazine recently published a list of quintessential beach towns on the west coast featuring Bandon, Astoria, Depoe Bay, Cannon Beach, Newport, and Port Orford. From all-to-yourself islands to hidden beach towns to iconic coastal experiences, the West has the beach vacation of a lifetime in store for you. As any upstanding Oregonian knows, the real old school Oregon coast lies down south, in quintessential Oregon beach towns like Bandon. You expect festivity: seaside carnival barkers, maybe a roller coaster. But actually … nothing is happening in Bandon. Tourists schlump down the street sipping coffee at the mouth of the Coquille River, at the town’s edge. Seagulls squawk on the Boardwalk, and a few sprightly old ladies sample the gratis cranberry candies at the Chamber of Commerce. The world slows down, and you notice things. Like the vibrant green algae growing on the rocks in the tidal flats south of town. Stroll out toward those rocks and look down, for Bandon’s best beachcombing is here. Bandon’s beaches can seem otherworldly, like a backdrop to a Maurice Sendak story. Stairs lead you down to the sand. Here is a little cave that someone has turned into a lean-to, lining thin driftwood logs across the front. Here is a curlicue tree limb, twisted in the surf like a giant elk antler. And here is a 40-foot-long tree trunk, bark and all, that will be swallowed up by the waves. Looming above everything are massive rocks that wade, humanlike, in the water. To read the entire article on Sunset.com, and find out the other 13 Top Unsung Beach Towns, click here.